Can you attach a project that shows up the issue? The minimum set of files needed to recreate it, may be just the . Hmm.. works fine for me using your project. Please open WebStorm built-in terminal and run'C:\Users\Kevin\AppData\Roaming\npm\bower.cmd install jquery --save' - does it work? Unfortunately not. The install step is missing. Let me ask you a question: just to be clear, after installing "jquery" package (using WebStorm UI or built-in Terminal), is directory "public\vendor\jquery" created on your local drive? A possible culprit might be configured "command processor autorun" (http://blogs.msdn.com/b/oldnewthing/archive/2007/11/21/6447771.aspx). I see public/vendor but not jquery. I don't have an autorun entry. Should I create one? If so what should its type be? I am sorry but I cannot glean what this key should be from the URL that you gave me. Surely it shouldn't be 'cd/'? 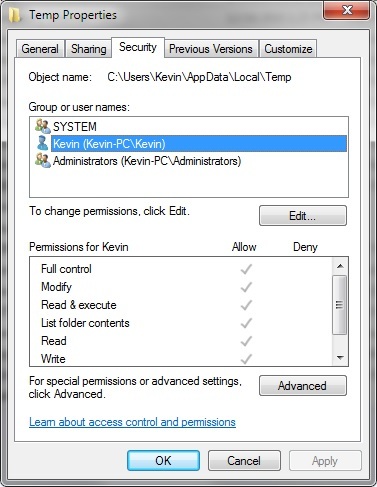 No, you shouldn't create autorun entry. Its presence might lead to unexpected things, because every time *.cmd file is executed, commands from autorun registry entry are executed too. Alright, "command processor autorun" isn't an issue in your case. So far, I couldn't reproduce the issue on Linux. Will test this on Windows machine. BTW, what does "scripts" object from .bowerrc mean? I couldn't find description at http://bower.io/docs/config . Thank you that worked much better. Unfortunately this didn't reosolve the issue. Unfortunately, I couldn't reproduce the issue on Windows 7. AFAIU, this issue isn't caused by WebStorm Bower integration, because WebStorm integration runs the same command as users type in console (i.e. "bower install jquery --save"). And the result is the same for you. I'd recommend you to file an issue in https://github.com/bower/bower. Reading bower source showed that a possible cause could be a thrown error that isn't logged and leads to bower process termination. The change is compatible with bower@1.3.12. You can try to apply it to your bower installation. Maybe it will help you to find out the cause. 1. Locate your bower package. Accoding to the attached idea.log, it should be located at "C:\Users\Kevin\AppData\Roaming\npm\node_modules\bower"
3. Replace "PackageRepository.prototype._resolve" method implementation with the one from https://raw.githubusercontent.com/segrey/bower/2e37c6ce5a4c294404e1e89b543b580d305b92ce/lib/core/PackageRepository.js and save the file. 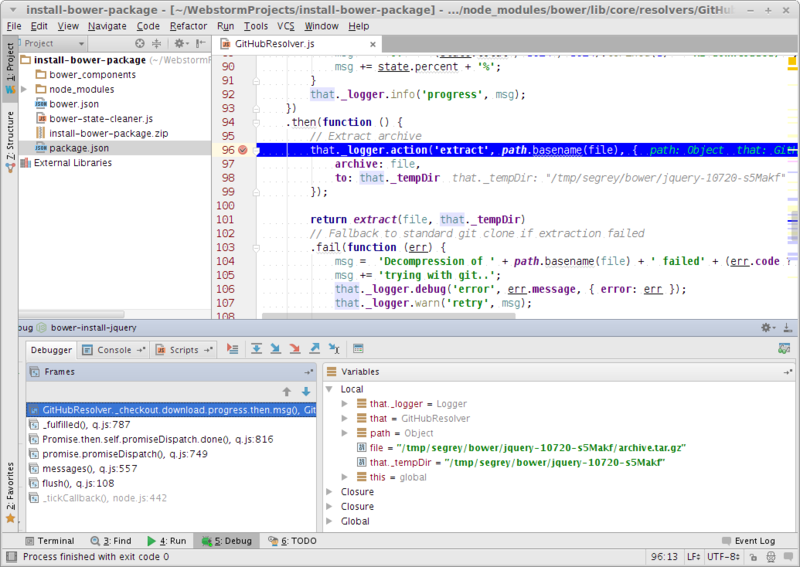 After that just run "bower install jquery --save" in console. Hope it will shed some light on your problem. I made the changes to the bower installation but I didn't get any different output. It seems like when it works (on a different machine) an additional "install" notification appears. But your output doesn't have that step. Well, it worked for me when I locked bower tmp directory intentionally to fail "extract" step. Did you run "bower cache clean" command? What is output of "bower cache list" command? Another possible culprit could be wrong fs permissions. 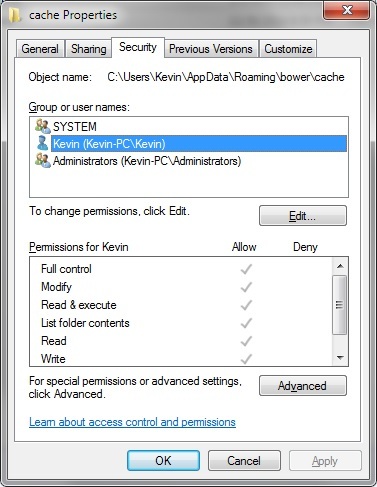 Please check permissions of these folders: "C:\Users\Kevin\AppData\Roaming\bower\cache", your temporary directory (%TEMP%). 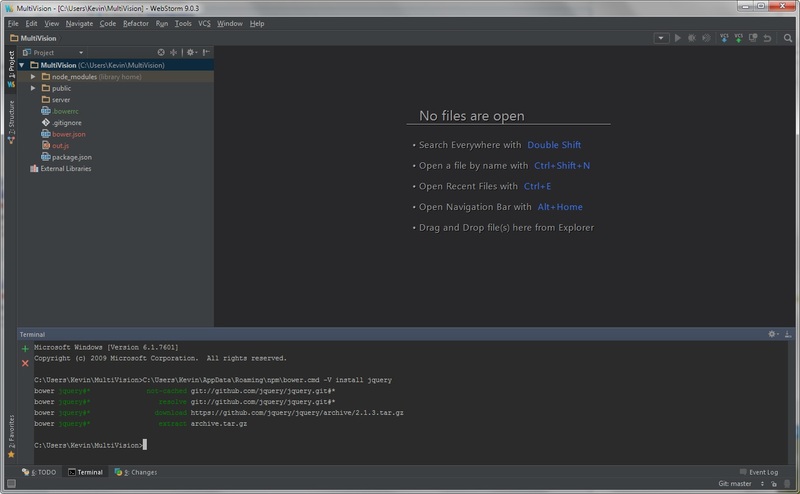 Also, you can try to install Node.js 0.11 (at this moment it's http://nodejs.org/dist/v0.11.16/). Thanks again. I installed Node 11 but with no results. I have attached the permissions for the bower cache and my temp directory, but it appears that I have full control of those folders. The command 'bower cache list' command yields a single blank line, no output. bower cache clean didn't seem to help either. About using Node.js 0.11: after installing you need to make sure that Node 0.11 is actually used to run bower. Also, you can try to downgrade your bower package. Maybe some previous bower version will work better on your machine. To downgrade to say 1.3.11, run "npm install bower@1.3.11 -g"
If nothing helped, then, well, seems you need to debug bower yourself. Debugging bower on my machine gave nothing - the issue isn't reproducible for me..
Well nothing worked. Do you have any hints as to how to setup bower for debug and/or where would be a good place to start? Sad to hear nothing worked. 3. Ensure that running "/path/to/node.exe ./node_modules/bin/bower install jquery --save" still doesn't work in console. 3. On the main menu click "Run | Edit Configurations...". You'll find there two preconfigured "Node.js" run configurations ("bower-install-jquery" and "bower-state-cleaner"). Correct path to Node interpreter in "Node interpreter" field for both run configurations. you have "extract" step logged, but not "resolved" (the next log entry). 5. 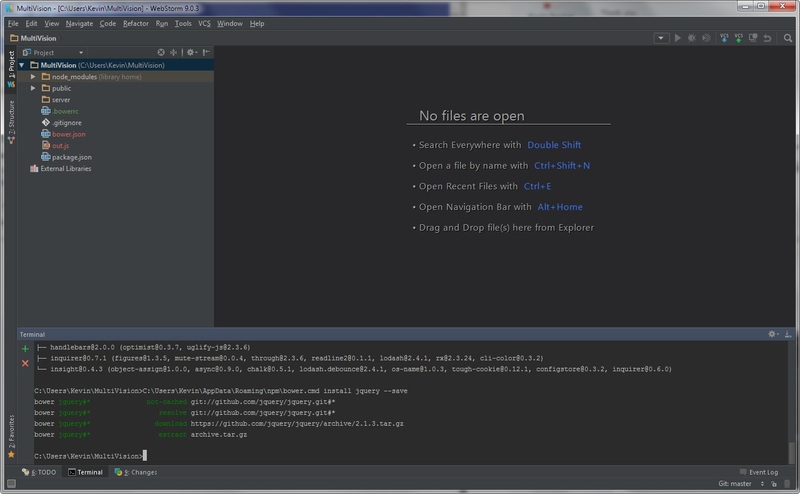 On the main menu click "Run | Debug..." and select "bower-install-jquery" in popup. 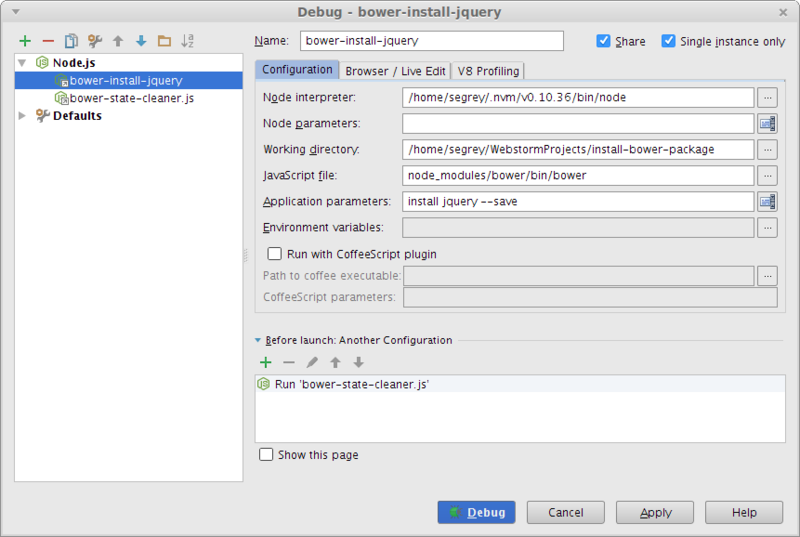 First, "bower-state-cleaner.js" file will be executed to prepare a clean state for debugging. If preparation is OK, debugging session will be started. All "bower-install-jquery" run configuration does is executing "bower install jquery --save" command. Then, you need to figure out why "resolved" action isn't logged. Good luck! Feel free to ask if you meet some difficulties performing these steps. Thank you very much. I think we are making some head way. I went through steps 1-3 and found that the command line that you suggested in 3 works. So how does that differ from "bower install jquery --save" (other than the obvious that one is running from node_modules and the other is from a -g install)? I would like to be able to use "bower install jquery --save". Great. Good to know it worked. Both command are run in the same directory ("/path/to/install-bower-package"). And the same node interpreter is used for both commands. If yes, then seems you need to compare two bower installations. Are they identical? Acutally it is a little different. still does not work. Any ideas what is wrong with my configuration? Do you run all these commands from the same directory (your project directory)? 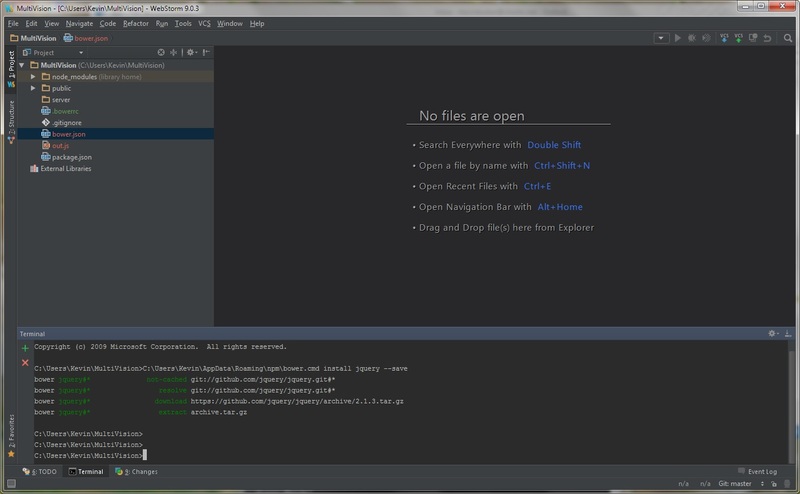 I run these commands from the WebStorm terminal console. When running "bower install jquery --save" in console, node interpreter "C:\Users\Kevin\AppData\Roaming\npm\node.exe" should be used. 2. Change directory to "install-bower-package/" where install-bower-package.zip is extracted to. Is it still failing as expected? Is it failing? What's the output? Is it working? What's the output? Basically all of the commands seemed to work. It has the feeling of a cache issue because I know it failed. And as soon as I declare it working I am afraid that it will revert back. Also what do you thing is up with the different node versions? Or do you think that is part of the problem? So having just one node version would be nice?